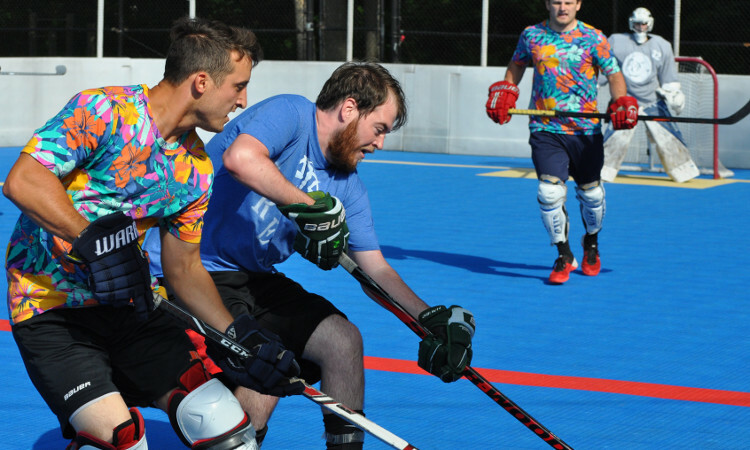 We are a collective of dek hockey players organizing pickup games, tournaments, and leagues in Columbus, Ohio. Dek hockey, also known as street hockey, or ball hockey, is a variation of ice hockey where the game is played on normal flooring with players wearing typical running, court, or basketball shoes. A ball is used instead of a puck; typically one that is bounce-resistant. Generally the rules are the same as for ice hockey, with five runners and a goaltender per team. On larger rinks, offsides is also played the same as in ice hockey, with a line delimiting the offensive zone. Painesville Dek Hockey is another dek hockey organization in Paineseville, Ohio with a dedicated outdoor dek rink. They run several leagues and host tournaments as well. Ohio Roller Hockey Co-op is a similar organization in Columbus, but for inline roller hockey.